What are the Google Chrome extensions? Google Chrome has an impressive number of extensions and add-on's facilitating and optimizing the experience of using the browser. All extensions to be installed in Chrome are stored in Chrome Web Store, an online store, or a Google repository, some are created to be used by IT developers. There are extensions for several targets and features, but one needs to install a reasonable number of them otherwise they will decrease browser performance. 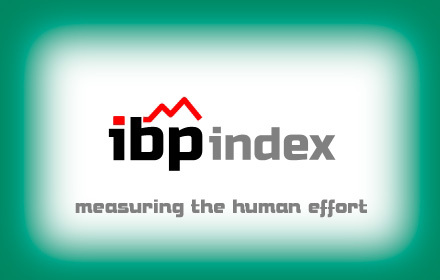 What is the IBP index? IBPindex is a set of algorithms that measure the difficulty of a route based on geographic data, and it uses a variety of error detection and correction methods and processes and big data analysis techniques. 100% objective an automatic, it allows you to know in advance the difficulty of Biking, Hiking, Running and Walking routes. Download any track from any user just with one click on the button present in the extension. Use three types of activity: Running, Hiking, and Biking. You can analyze the difficulty of the same route for any of these three sports. Open the extension Garmin Connect IBP while browsing an activity from Garmin Connect; you will see: the IBP index score measuring the difficulty of the track, the download track button, and the rest of the available options. Level of Correction: If necessary the IBPindex system corrects mismatches in the GPS data, the correction levels go from “0” (no correction) no “7” (maximum correction). Accumulated Climb: It measures the accumulated positive climb applying the optimizations of the system IBP. Reanalyze as: It allows you know the difficulty of the displayed route when performed in another of the three available activity types (Biking, Hiking, Running). Detailed Analysis: It displays a thorough analysis of the route showing you a detailed set of data such as information about ramps, swings or changes in direction, reliability, etc. 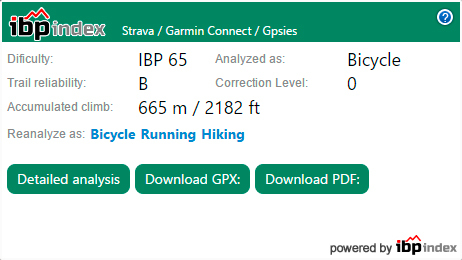 Download GPX: Download all the original data of the activity (including heights) in GPX format. Download PDF: Download the activity information in PDF format. (?) : Help and technical support options for the for the extension Garmin Connect IBP. "A analyzable activity was not found, make sure you are in a analyzable activity"
"Web unsupported by IBP Index"
"We’re missing some metrics to perform the analysis"
How to get this extension? Price: the extension is 100% free.